After spending a great deal of time researching various options for a personal trainer we were fortunate to be referred to Brian Theiss for the physical rehabilitation that we needed. We had been told that Brian specialized in working with those people who had specific medical problems. My husband, Larry, was recuperating from a heart attack and bypass surgery and I had thirteen years of chronic pain in my left shoulder and on the left side of my face. 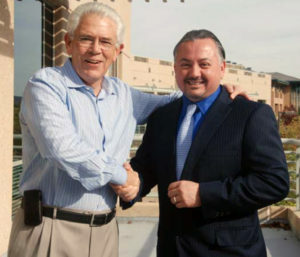 After speaking to Brian both Larry and I were convinced that we were finally blessed with the guidance we both needed for proper rehabilitation as well as for the personal care that we both felt we wanted. We had spent quite a lot of time researching other personal trainers and other gyms and no one came close to what Brian had to offer. The personal trainers at the local gyms were very young and not experienced in medical physical rehabilitation. Most were fresh out of Junior College with very little experience. In fact, most were looking for experience and frankly neither of us wanted to be guinea pigs, when in fact we both had chronic conditions that needed rehabilitating. Brian always starts his clients’ exercise program by demonstrating the exercises himself with his trainer standing along side of him watching his techniques so that when the trainer takes over they are cognoscente of proper style and position for the specialized program Brian has set forth for your individual needs. There is a unique rhythm, style and routine necessary to make Brian’s program successful, without that consistency you have deviated from the success he has worked and studied so long and hard to accomplish. Larry and I have had the opportunity to work with both of Brian’s trainers, They both have strong backgrounds in nursing, which was extremely important to both Larry and I, and they both present themselves very professionally. Their sensitivity to our medical problems and their ability to execute Brian’s exercises are impeccable. You know that when you work with them you have their undivided attention and that they are focused on your every need. Both Kris and Krista are very positive reflections of Brian’s specialized program. 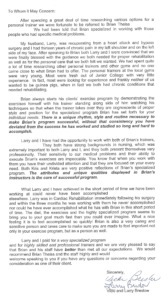 The attributes and unique qualities displayed in Brian’s instructors is the core of a successful rehabilitation program. What Larry and I have achieved in the short period of time we have been working at could never have been accomplished elsewhere. 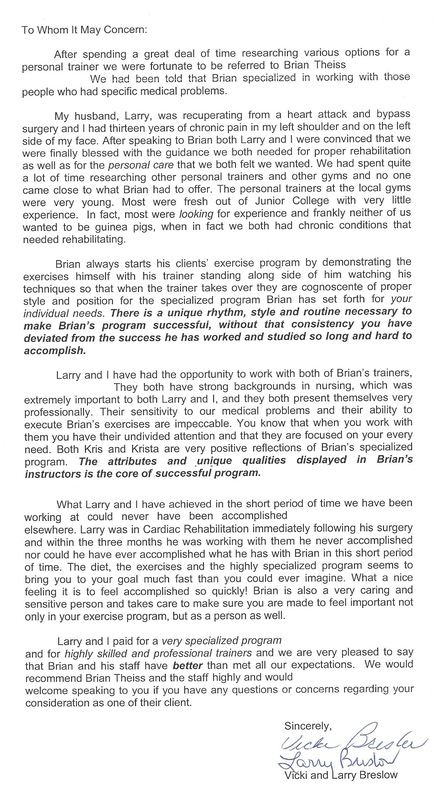 Larry was in Cardiac Rehabilitation immediately following his surgery and within the three months he was working with them he never accomplished nor could he have ever accomplished what he has with Brian in this short period of time. The diet, the exercises and the highly specialized online fitness program seems to bring you to your goal much fast than you could ever imagine. What a nice feeling it is to feel accomplished so quickly! Brian is also a very caring and sensitive person and takes care to make sure you are made to feel important not only in your exercise program, but as a person as well. Larry and I paid for a very specialized program and for highly skilled and professional trainers and we are very pleased to say that Brian and his staff have better than met all our expectations. 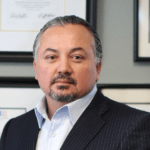 We would recommend Brian Theiss and the staff highly and would welcome speaking to you if you have any questions or concerns regarding your consideration as one of their client.